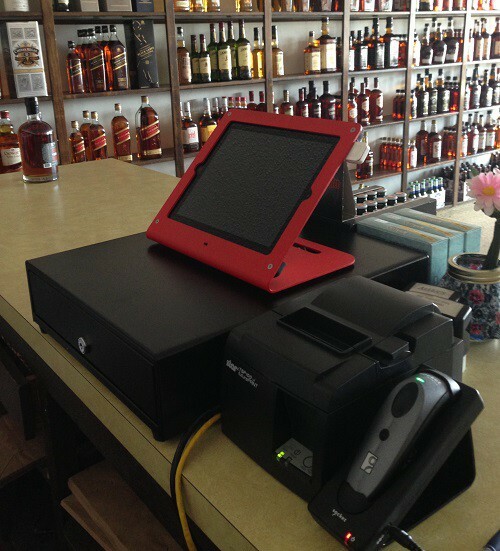 In September 2013, we converted our liquor store from using an old-fashioned cash register and paper records to using an iPad-based Point of Sale system. I learned so much in the process that I knew you’d want to me to share. When my mom bought her liquor store in 1992, it came with a traditional cash register, an adding machine, and no detailed sales records of any kind. Being a good geeky person, she started researching what computerization would make sense. PC-based Point of Sale (POS) systems cost up to $5,000 back then (and that was a lot of money in 1992). They were clumsy and expensive and looked really hard to work with (thus truly earning the name of POS). So Mom designed a paper system. Up to 1200 SKUs (or different items), all on paper. Every time one of us made a sale, we recorded each item on a printed-out spreadsheet we kept in a binder on the counter. We figured prices with another spreadsheet. Want to know what sold well for Thanksgiving last year? Well, dig into the pile of paper and find November last year, then scan through the entire list to find the big sellers. It was a pain, but it was so much better than no records at all. It worked well enough. By 2006, when Mom retired and we started, POS looked a little more attractive, a bit better polished, but still expensive. Liquor store-specific systems ran from $5,000 to $10,000. And in a small town, I knew I’d be on my own for tech support. I took a fresh look at our spreadsheets, and streamlined them. I got it down to one master spreadsheet, easier to keep up-to-date. It was an improvement, but we still needed a real inventory system. One that wasn’t just on paper. Our first step toward POS: Square for credit card processing. When we finally converted to Square for our credit card processing, I was tempted by all the Point of Sale features that they built into their app. It could act as our cash register! We could even enter all our items, but Square still couldn’t track inventory. I really, really wanted inventory tracking. So I started searching. Is there an app for that? Turns out, yes, there are a few solid iPad-based Point of Sale systems that include inventory tracking features. I looked at Vend, Revel, Intuit, NCR’s Silver and ShopKeep. If you are looking at different systems, I suggest you start with the company websites and also pay careful attention to how well they treat you on the phone. Phone support makes the difference between a quick resolution of an issue and frustrating hours figuring it out for yourself. Update: As of May 2014, Square is starting to add more inventory features. After initial research, I decided on ShopKeep Point of Sale. What tipped the scales for me was that ShopKeep was created by a frustrated wine shop owner who decided to build what he himself needed. So surely it would have features that a liquor store would need, right? (It’s pretty close!) I was also influenced by their customer service and terrific phone support. I started by setting up a test store from my iPad and trying out some test items. As I played with it, I started a list of questions. The more I played with entering items, making pretend sales, and watching how it handled inventory, the more I understood the basics and the more I could ask more detailed questions. I put in a phone call to ShopKeep to ask those questions. My customer service rep Kevin was very good. He answered all my questions and took all my suggestions for improvement. I spent a lot of time thinking through how the system would actually work in our store. For example, all these iPad POS systems use little icons or buttons on screen to represent each item or SKU. In our case, that would mean a product like Jack Daniels would need 5 buttons for all the different sizes, and it would be all too easy for a clerk to tap the 750ml icon when selling a 1 liter bottle (since they look close to the same size), or even the 375ml icon when the sale was actually a 1.75 liter. (375 and 175 sound similar in your head, but 375ml is about a pint, and 1.75l is about a half-gallon.) (Those of you raised with metric system, stop laughing!) That kind of mistake would be very costly. So we decided to go with a handheld scanner to read the barcodes on bottles. That way, there is no need to pick the right button. The scanner is much more accurate than a person. And quicker. We already had an iPad we used for our Square credit card processing. So we didn’t have to buy a new one. We did buy a snazzy new red iPad stand, a fancy receipt printer and a compatible cash drawer. Our equipment costs added up to about $1100. But a smaller business could get away with around half that by cutting out the bar code scanner, or the receipt printer and cash drawer. Technically, all you really need is the iPad. To get all of our items (over 1,000) into the ShopKeep system took time. We had to take our old spreadsheet system and copy or retype the info into the format that ShopKeep wanted. We also scanned the bar code off each bottle to add that to the spreadsheet. Since we didn’t have the bar code scanner yet, we used our phones, which was a pain. I recommend you get the scanner you’re going to use and use that for your data entry. Update: As of May 2014, ShopKeep has made importing much easier. You can import in batches, and you can update items in bulk. Then we did a small amount of testing and went straight to using the system full time. I will admit it would have been smarter to do more testing and work out bugs without using customers as beta testers. But it was such a step forward we just couldn’t make ourselves wait any longer! Square and ShopKeep are not integrated. To take a payment with Square, we had to leave the ShopKeep app, and open the Square Register app to accept the payment. This isn’t good for service. So we decided to try out the credit card processing recommended by ShopKeep, a service called Payment Revolution. (ShopKeep has since acquired Payment Revolution.) Having had a very unpleasant experience with traditional merchant processing, I was very, very cautious. But Payment Revolution allows month-to-month service without a long term contract. This was enough reason for me to try it out. I knew I could return to Square at any time. The equipment cost was less than $200, which I could pay up front. No nasty unending equipment lease. So far, the service integrates flawlessly with ShopKeep and has not hit me with any hidden monthly fees or unexpected expenses. It isn’t as up-front clear about total costs as Square was, because it is a traditional interchange-based processor. That does mean lots of variation between transactions. (Rewards cards get charged at higher rates, and so on. When I look at my monthly statement, I see 7 different rates just for the different types of MasterCard.) My sales rep with Payment Revolution could only give me an approximation of 2.4% effective rate based on our sales volume. I had to wait for my first full-month statement to figure out what the effective rate turned out to be: 2.32%. (Total costs/total processed=effective rate.) It varies every month, based on how much volume, what type of cards customers use, etc. Then I could compare that back to Square. We were using Square’s monthly pricing, which brought our effective rate down below 2%. If only Square was an integrated payment method in ShopKeep, that would be slightly less expensive. But Square and ShopKeep see themselves, if not as direct competitors, at least as not willing to cooperate. So we’re using Payment Revolution for now. But I’ll be keeping an eye on the effective rates and the cost difference compared to Square. Update: As of March 2015, we’re still with Payment Revolution and still satisfied. ShopKeep has just acquired Payment Revolution (bought the whole company) so I expect they’ll continue to work together very well. Payment Revolution and ShopKeep have updated to accept Apple Pay and have a special reader that works with Apple Pay and will work with the new chip credit cards as they are rolled out. The people working the front lines love the new system. No more marking down every item sold on paper. No need to train any new person in the arcane organization of liquor items by category. (“Is honey whiskey a straight, or a specialty?”) No need to know the category system to look up a price. No need to write down your clock-in and clock-out times. All of that is handled by ShopKeep. Customers have commented repeatedly on the high-tech look and feel of the system. We’re also giving customers faster checkouts and fewer out of stock items with this system. Update, March 2015: Now that we have a year and a half of data, it’s a dream. We are much more accurate in managing our inventory with such detailed data. ShopKeep has also continued to add features, like gift cards, cool email receipts, integration with MailChimp for email marketing to your customers, a better reporting dashboard and marketing dashboard, and lots more. Stuff like this makes me wish I were a shopkeeper. Sounds like fun! it is kinda fun, Nick. I am just curious, as i am developing an Android based shopkeeping system (TabShop), which systems did you evaluate and why didnt you mentioned any iPad alternatives? By the way, great article! During my work i experience a lot of really cool individual businesses all around the world that are switching over to a lean tablet based solution. Wolfgang, I chose to look at iPad-based solutions because we already had an iPad we were using in the business. Switching to another platform would have been a double cost in equipment and in training. I looked at Vend, Revel, NCR Silver, and probably a couple more that I briefly glanced at. I’m glad you’re developing for Android to give more choices to small businesses that are either already using Android tablets for something or are not using tablets at all yet. I love your move toward paperless. I also appreciate that you have a paper tape, for your more traditional customers. I would guess that it will result in a big time savings, when it comes to balancing the books. Thanks, Paul. I hadn’t really thought about any cost savings. It was more about providing better service, but you’re probably right, too. Hi Becky – are you finding your experience with Payment Revolution to be positive? I just started working with Shopkeep for my new store and went with Payment Revolution over my bank, Bank of America. I figured I could try them since there’s no contract, but would love to know what you think now. Thanks! Sydney, so far, I’m satisfied. The integration works perfectly, and the rates have stayed reasonable. They have not hit me with any unexpected fees or any “surprise” nastiness. I wanted to know the bundle cost of your cash register using the iPad. I am looking into starting my own business in Georgia, and I am trying to get all my costs lined up. I would need everything for the cash register. Nichola, we spent about $1100 not including the iPad. That got us a drawer, a printer, a stand, and a UPC scanner. But you’ll get more up-to-date info from the providers’ websites, such as ShopKeep’s hardware store. Have been looking at these systems, not liking the $49/mo subscription fee. Would rather buy the software flat out. Kirk, there are still some systems that price on a flat fee rather than monthly. Some, like Square POS, have no monthly fee but have fewer features. So look around at the many systems currently available to find your right fit. Are you still satisfied with Shopkeep? I own a small wine store (opened last August) in MA and right now I just have a cash register. Inventory is very hard to manage and we do a full store count every month. A POS will make things much easier, especially if we can create customer lists and manage gift cards and frequent buyer cards on it as well. Do you do any of this? How do you justify the $49 a month fee vs. no fee on a traditional cash register? We are a small store, thats a pretty big fee. As for justifying the $49, how much does that monthly inventory count cost you? Tracy, I just learned the ShopKeep has improved how they track different tenders including gift cards. It’s not a completely integrated gift card system, but it’s a step towards that. Update, March 2015: ShopKeep now integrates gift cards completely, and has improved their customer lists to be more like a CRM (customer relationship manager). All that data entry sounds grueling. I thought you had everything in a spreadsheet already? Does Shopkeep not have an Import feature? And $1100 for a printer, scanner and cash drawer is way too much. Did you purchase the hardware from Shopkeep? Morgan, think of it like learning accounting software like QuickBooks: the hardest thing you’ll do is setup, and you have to do that first. Now that I’ve actually finished ours and helped another business with theirs, I can say the second time was much easier. For our setup though, all our data was in a spreadsheet, but not in a way that was right for importing to ShopKeep. Our descriptions were abbreviated in a way we understood, but might not make sense on a receipt. So all the descriptions had to be rewritten. ShopKeep needs lots of additional data columns we had to fill in. We had to double check all cost numbers to be sure we had the current wholesale costs. It took time. Since then, ShopKeep has improved their importing process, and you can do it in batches and even make batch corrections, which is very helpful. I felt the same way about the cost of the hardware, but it makes sense. This is not just a $50 desktop printer; it’s a specialty receipt printer that communicates with the software and the drawer. The drawer isn’t just a box, but also listens to the printer. We also got mounting hardware for the drawer and a tough metal iPad frame. The high ticket item was the barcode scanner. I did shop around and compare hardware costs. I found that ShopKeep was pretty competitive with other sources. And, remember, many stores don’t need as much hardware as we did. Is ShopKeep right for you? That’s something you’ll have to research for yourself. I do strongly encourage every small retail business to look into the many iPad-based alternatives to that clunky old cash register. This is a great success story of how small retailers are utilizing technology to enhance the customer experience whilst also reaping the benefits (inventory management, coat savings, etc). One question I have on the interchange fees side of things – is there a way of avoiding having to programme all the different MasterCard (or other schemes) fees associated to Credit/Debit transactions whilst also keeping the system integrated? AJ, thanks for the kind words. Through the integration, all the fees are handled in the background. I never see them until I review my monthly statement. Thanks for this question. I’ve clarified in the original post so it’s not so confusing. Great read. I’m planning on opening up a shop within a year and have started looking into registers, and game across this. Are you still liking the system this far out? Have your rates with Payment Revolution still been acceptable? Do you have any kind of complaints in general about switching over or this particular system? Jay, I do still like the system. ShopKeep continues to improve their product. Payment Revolution rates have been pretty stable for me. We’re still using them. I think I listed all my complaints! If I was opening a shop, there is no question I would use a system like this. Which particular system would depend on the size of my shop and inventory needs. Even though I work for a different iPad point of sale system called Change (www.change.io), I found this post incredibly helpful. We want to make our system the best it can be and I appreciate the time you took to outline your pain-points, your needs, and how you ultimately came to your decision. I hope to use some of this information to help our customers as well! Thanks, Amanda. I’m excited to hear that you’re taking this feedback to Change! Rick, I’m very glad you found this helpful! This was such a great article and really gave me hope as to what we could achieve with our gift shop. I do have a questions for you about your experience with square’s software (their help center isn’t too helpful). We are needing to have about three layers to our inventory. Retail Sales > Gift Shop > Books > Individual items. I don’t think square allow for that many layers but I’m not sure, is this something you have come across? Secondly have you reached a limit on the number of items in a department (I think this might be considered the third level in my above example)? We are trying out otterology to help with inventory tracking (it is square compatible), any feedback on that? I know you didn’t mention otterology in your article but thought it was worth a shot to ask! Lastly, you mention that you are using the bar-code scanner and that is something we would like to use also but we need to print our own bar-codes because most of our items are handcrafted. Does square offer that type of software? Sorry if I asked some questions that might be too technical but Square support isn’t very helpful! Thank you for your help and again what a great article! Brie, I’m sorry that I can’t answer your Square questions. I simply don’t know enough about Square’s items because we only used it for credit card processing. In general, if you can’t find a real person to answer these questions now, I’d say that’s a bad sign for getting answers when your business is on the line. You may want to consider a different service because of your detailed business needs. Hi Brie and Becky. I love all the info. I live in FL and have several retail stores. After having tried NCR I am now using Clover from Bank of America and absolutely love it. Every time I had an issue they would say it was the ipad and apple would say it was not. Apple did tell me that the ipad was not designed for commercial use to begin with.I have a local rep, Diana who is amazing and understands our needs and is always available. She helped us organize our inventory on a spreadsheet and once that was done she uploaded it to dashboard and there it was on the tablet! Complete with description, cost, price, sku, qty. I am with Becky if you can’t speak to someone that is not a good sign. Clover does have bar code scanner, pin pad for pin debit, scale and they have an app that integrates with the system to print barcodes. I just added the app that integrates with Quickbooks. They have and android based tablet and it is sold all together you get the tablet with integrated swiper, printer and cash drawer. Janet, thanks for sharing your experience with Clover. It’s exciting that there are so many POS systems now. I like everything I have read about Shopkeep. They keep sending me emails and I keep asking them if they except checks. In our business we have to be able to keep track of check payments. There has been numerous times that a check has not made it into the office for understandable reasons (not excusable) and we were able to retrieve it. How are some of Shopkeep users handling excepting checks. Thank you. Scott, we treat checks just like cash at our store. If a check is missing or cash is missing, the drawer will be short at the end of the shift, so we know to look for it immediately. We don’t want either checks or cash to go missing for any reason. You could use the Other tender category in ShopKeep to show checks separate from cash, I suppose. I found the best way to get answers from ShopKeep was to pick up the phone and talk to a rep. Ours is Kevin, and he was very helpful. Scott, I just learned that ShopKeep has improved their tender tracking, including a special category for checks that would address the exact need you’ve outlined. I have a small business and am looking into inventory/register/pos. Not pleased with the spectre of a monthly fee, but trying to get comfortable with it. On the other hand, I do have my merchant services figured out, and I very much want to recommend cardfellow.com to EVERYONE. Cardfellow is a neutral service that compares credit card processors: your current provider with others who have signed up with them to vie for your business. Cardfellow’s recommended merchants promise to keep your rate for life (!) and there are never any contracts or fees for signing up. Cardfellow will audit your statements to be sure that the merchants are holding true to their word. I had a very positive experience with this service, and came away feeling like I truly had someone looking out for me in the sea of sharks with hidden fees and all that. Suzanne, I’m glad you had a good experience with them. With so many alternatives to traditional merchant accounts, no one should sign a long term contract with a merchant and never ever lease a credit card terminal! This is timely since we just bought part of another retail stores equipment and in the mix was a POS system but we have no idea if it works. It does have a cash drawer similar to the one pictured but may be too old to be compatible but this is really helpful as we go forward to improve the tracking in our little “thriftique”. A friend of mine who has a repair shop just went the iPad route so I’m intrigued to learn more. Enjoy and look forward to SBS. A note of warning to fellow small business owners, stay away from FirstData credit card processing like the plague. Unless you done business with them, you have no idea how many hidden fees they can stick you with. I went through my bank, who hooked me up with FirstData. I didn’t do my homework, nor did I say let me cipher over this for a day or 2. So, really no one to blame but me. As you advise, I bought their wireless terminal – which cost me $800.00. You can purchase the same terminal from another company, that I believe is a subsidiary, for $399.00. Used the terminal at one craft fair, received about a 15 page invoice with nickle and dime fees for a sack full of head scratching charges. Then they hit my bank account without any prior notification for over $1,000. Was not past due, no explanation other than your contract gives them that right. Paid a fee to cancel the contract and they continued to debit my account for a fee. Had to close my bank account to stop their intrusion. Many thanks for you are doing to help and promote small businesses. Thanks for sharing your story, Jerry. Sadly, many different merchant services and many equipment lease companies act just like you described: greedy, unfair, and uncaring. And just like you, I made a decision on my initial provider way too quickly. Now I know better, having learned the hard way. I’m still in dispute with the equipment leasing firm. do you use quickbooks? and does shopkeep integrate with your quickbooks? if so, do you have to pay an additional monthly fee? currently i use an iPad in my store and use the quickbooks app to accept payments using the intuit card reader. but, i’m always looking to see if there is a better, more cost effective method. Sharon, I don’t use QuickBooks, so I don’t know the answer. Definitely something you’d have to check at the ShopKeep website. You can also check other tablet POS sites, because I’m sure I’ve heard that some are QuickBooks compatible. If you look around, I’m sure you’ll find one that fits your business. Update: ShopKeep is in fact able to integrate to QuickBooks. Anyone hesitant about paying a monthly fee for a cloud based POS has not paid out mega bucks for support contracts or upgrades on overpriced traditional systems. We are on year 3 of Lightspeed cloud (was MerchantOS) and we love it. With a cloud system you can change it if and when you want to, no big outlays or commitment (think marriage contract and or divorce in a traditional POS) I’ve heard other good things about Shopkeep. We have used Square occasionally for remote use and it was fine on the iPad. We use an IMac for our POS by the way but we can use it and access with our iPad or iPhone. Isolde, I never could make myself pay those huge costs for old traditional POS, but $49 per month is well worth it in my business. You make a great point about the many cloud-based systems: they are easy to leave if you don’t like them. The big decision is getting off paper and getting real about your system. Comments are automatically closed on older posts, but you can send me your comment via this contact form, and I’ll add it manually for you. Thanks! I do know that Square and ShopKeep both support users in Canada. You’ll have to check on any other specific app you’re interested in. Any Canadian retailers have experiences to share? Tell us about the through the contact form.